The United States will immediately give Israel $70 million for additional Iron Dome batteries, U.S. Secretary of Defense Leon Panetta told Israeli Defense Minister Ehud Barak in a meeting between the two Thursday. 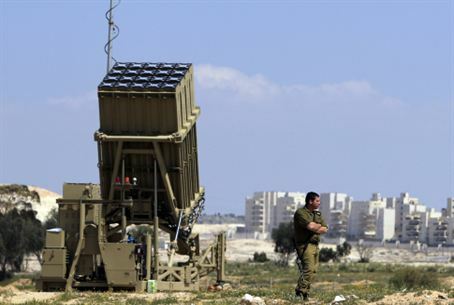 Washington has already given Israel $205 million for the Iron Dome systems. Panetta said: "Our goal is to ensure that Israel has the necessary financing every year in order to produce these batteries that protect its citizens." Barak, who met Panetta in Washington, thanked him for American defense aid to Israel. The two men met for an hour. "On behalf of the nation in Israel I want to express my gratitude to President Barack Obama and the American administration for the security aid to Israel, for their complete commitment to the security of Israel and for the additional aid recently approved for purchasing Iron Dome batteries," Barak said. "Security relations between the United States and Israel were never stronger than they are now." "The additional aid for purchasing Iron Dome was given at a very important time and we are grateful for it," he added. "The Iron Dome batteries give us, in the political tier, more diplomatic maneuvering room, and will help prevent an escalation toward war."